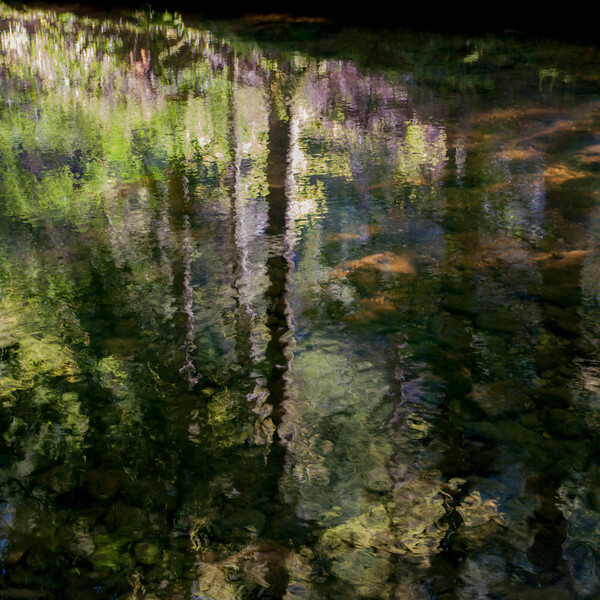 An impressionistic ripple effect tree reflection in the river Areuse, Switzerland, 2012. Once upon a time, children saved money in a piggy bank and grand parents had an old sock underneath their mattress that held their savings. As time went by, saving became more sophisticated and a profitable business. Savings books and later shares replaced the pottery pig or the woolen sock. I believe we have now reached the most evolved method of saving: By spending money! Consumerism advertisement tries to convince you that paying less than the regular price equals saving money. This is a very smart concept and a fallacy that many succumb to. However, nobody has ever saved money by spending it! I have just visited three major photography retailer websites (Adorama, Amazon, and B&H). Two of these (Amazon and B&H) inform me with a dedicated title instant saving or you save that I save for example 80 or 200 USD and only have to pay 300 or 3500 USD, respectively. In contrast, Adorama seems to pursue a more correct and commendable strategy: They only announce a special price and a regular price, but do not promise any savings. Does this make the Adorama deals less attractive? I hope not - the opposite should be the case! Save is one of the most mis-used words in advertisement and at the core of the consumerism brainwashing machinery. What I find particularly shocking is that savings seem to replace criteria of quality and actual need. Often, cameras (and of course also other products) are advertised solely with the savings that their purchase promises. The meaning behind this advertisement language is: "We have absolutely no argument why you should buy our old and soon to be replaced camera and therefore we make you believe to save money by buying it so that we can get rid of our stocks." I hope that you are aware of this meaning and do not fall victim to such promises of great savings. I do not at all suggest to refrain from buying cameras, lenses or any other tool or item that you really want to use. I would even help you decide what photography equipment is most useful for you, if you want. If you can afford, buy all the things that you really want to use and rather decide based on the quality of the product than its price or novelty. However, do not believe that you will save money by buying something, because you will not. Similar problems are actually commonplace in other areas as well. For example, you neither loose weight by eating nor do you protect the environment by buying a new car. Carcolors 24: A greenish-bluish carcolor composition. The distorted building with the "sky hole" is located close to where I live. 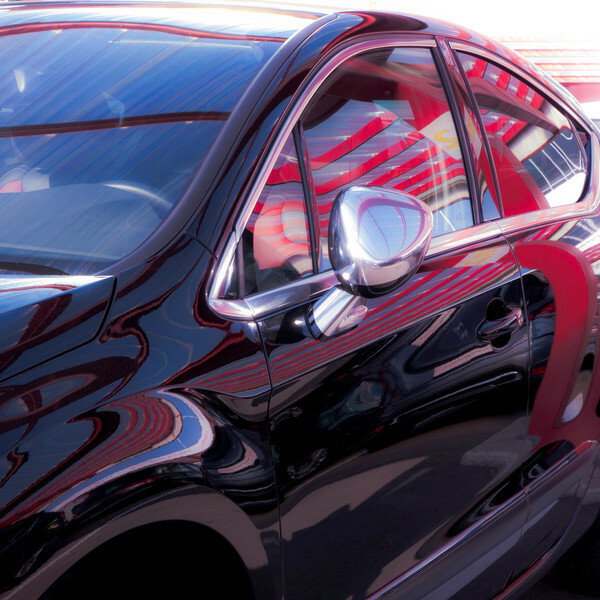 Nevertheless, impressive carcolor reflections are not so frequently found because there are no parking lots nearby. In this case, a clean, dark and shiny car was parked on the side of the road (illegally) and thus permitted this photograph. Many more carcolor compositions were introduced in earlier posts and are displayed in my Carcolors gallery. Today, I would like to add a macro tilt-shift example and inform you about an incompatibility issue, which I have just become aware of. The photograph above is not particularly remarkable in any way and it is not about the flower either (I may introduce the plant in a Flora post in the very distant future - if I should ever manage to encounter these plants in full bloom). 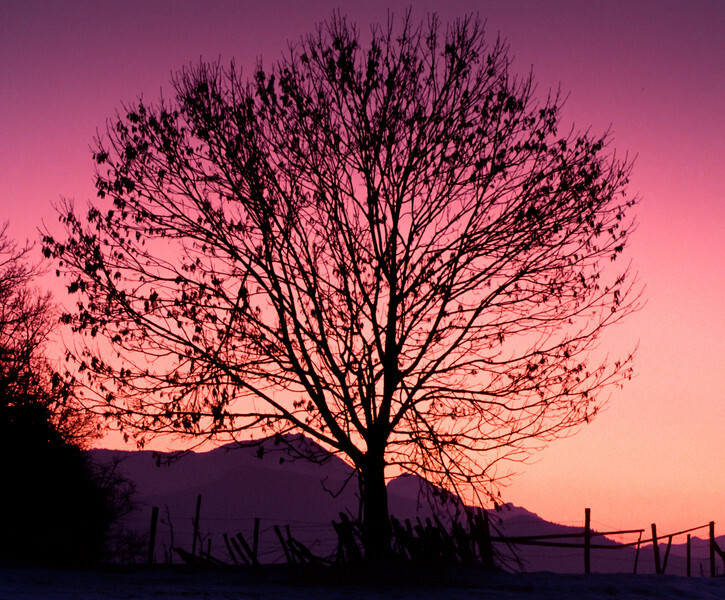 It was the main goal of this photograph to illustrate the tilting of the plane of focus. Therefore, I have tilted the lens (an old Canon 100 mm Macro lens) to the right. Notice how the focal plane runs diagonally from the lower right corner to the upper left part of the photograph. The second goal of this blog post is to inform about an incompatibility with the Mirex tilt-shift adapter, which I have just realized: It does not seem possible to mount Canon EF-S lenses on the adapter. In theory, the image circle of the EF-S lenses, made to cover an APS-C sized sensor, should be sufficiently large to allow tilting and shifting the lens on a micro four thirds body. However, as far as I understand, the problem is the rear lens element of EF-S lenses, which protrudes further into the body (the adapter in this case) and thus prevents fitting the lens on the Mirex adapter. I have only tried mounting the 18-55 mm EF-S kit lens (an early, unused version that I have lying around in a dusty box), but I would assume that other EF-S lenses would not be compatible with the Mirex adapter neither. I am not bothered by this incompatibility, since I do not have a lens that I would want to use with this adapter and the image quality obtainable by tilt-shifting a full-frame lens will certainly be better. However, the thought of a 10-20 mm tilt-shift zoom lens (just as one of many possibilities) was enticing for a moment. It is again time to bid farewell to a once appreciated camera and to honor the service it provided and the invaluable experiences it permitted with a few photographs. The photographs shown in this blog post were taken with my old and almost antiquarian Konica FT-1, which I have just sold. It was the second (and last) Konica body that I have owned and used on many trips and hikes during my youth. Konica cameras were the first SLRs that I owned, which is why I feel particularly attached to these cameras. The Konica Autoreflex TC and FT-1 were the perfect tools to learn and practice photography when I was still in school. They were very resistant bodies with refreshingly few and simple switches and neither the bodies nor the lenses were expensive but nevertheless of excellent quality. Already when I bought my first Konica, the brand was on the skids even though they were very inventive and progressive in the early days of SLRs. If you wonder why you have not come across any Konica camera recently, it is because their camera business merged with Minolta (another extinct, prehistoric animal) and later disappeared when it was terminated and sold to Sony. Despite my fond memories, I have not been using any of my film photo cameras since many years and felt burdened by their unused existence in a box in a cupboard. Therefore, I am really happy that I found somebody who will actually be using my camera companion of the past. In line with my credo for moderation and my motto that less is often more, reducing equipment is liberating and beneficial. I am on the right path: During the last years I have been selling far more cameras (two) and lenses (four) than I have bought (1 lens). I still own more lenses than I can use and also have two functional cameras that are not used anymore sitting in a cupboard waiting to find a more appreciative user (or to be put down in a recycling station). Today's Flora-post should be a spring greeting, but due to the cold and dull weather it is rather meant as a spring invocation. This contribution is about the wild daffodil (Jonquilles in french, Osterglocken in german, Narcissus pseudonarcissus in latin). 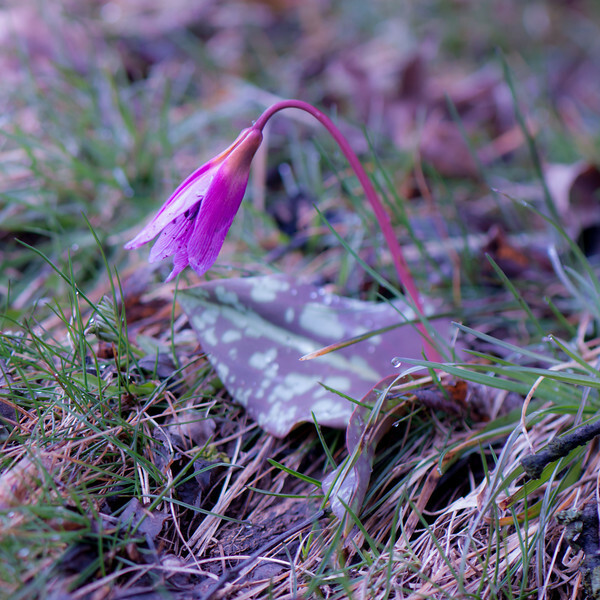 The literal translation of the german name actually means "easter bell" and at least here in Europe it is a typical spring flower that is mostly known from gardens and flower shops. It may come as a surprise that the wild form of the daffodils look very similar to the cultivated varieties in your garden or vase. The original home of the wild daffodil is Spain and Portugal, where many different species occur in the wild. 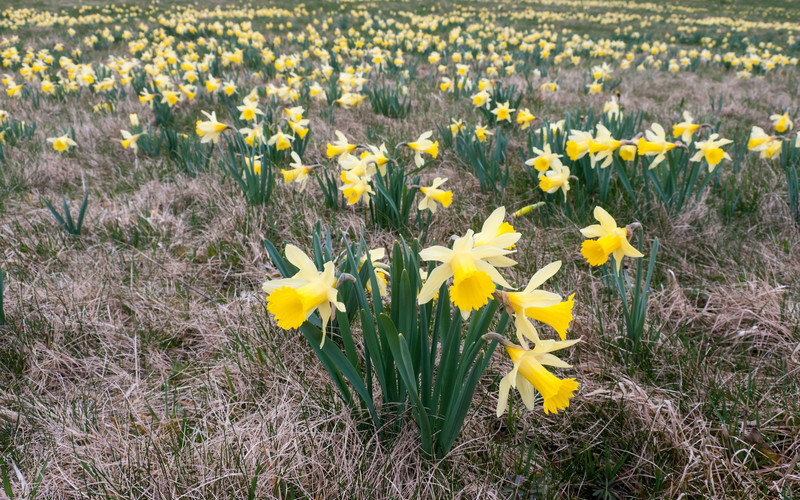 From Iberia, wild daffodils have migrated east- and northwards to middle Europe and to England. In central Europe, wild daffodils have become a rare sight in many places, but in some locations in Europe they are very abundant and color meadows in yellow during spring time. 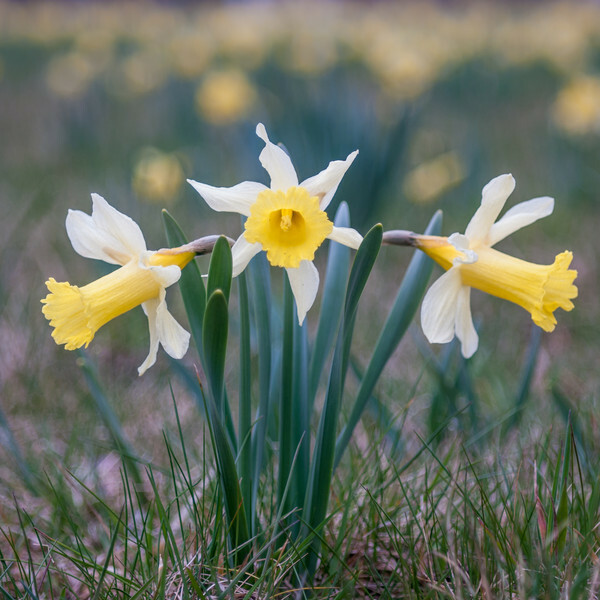 Since daffodils are so popular in gardens all over the world, "escaped" plants have established populations also outside of their original home range. For example, naturalized daffodils are found in the Australia, New Zealend and the USA. A year ago we drove through the Vosges mountains of France in the hope of discovering "true" wild daffodils. In particular the city of Gérardmer is known as a wild daffodil hotspot. In spring, these impressive flowers abound in the meadows around this little town and form yellow carpets. We were lucky that the Fêtes des Jonquilles festival was not celebrated last year, because millions of flowers are picked for this event. However, the festival will be celebrated next weekend, on April 14th (the celebration takes place every other year). Narcissus pseudonarcissus belongs to the family of the Amaryllidaceae, which also comprises the Amaryllis featured in an earlier blog post. 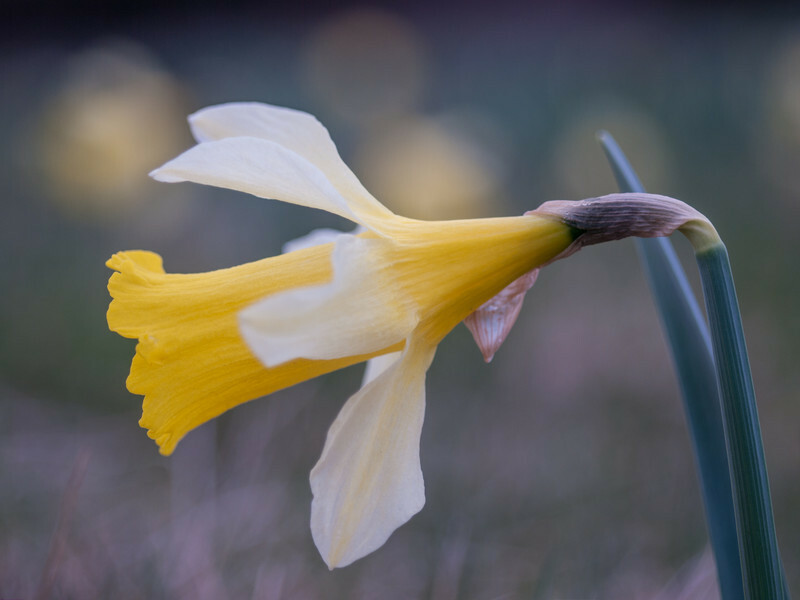 All Narcissus species are perennial plants that hibernate as a bulb, form lanceolate leaves and display large flowers with a distinctive trumpet (corona). In particular in Spain and Portugal, many sub-species are distinguished, some of which are very rare. In contrast to the most commonly cultivated daffodil, the wild daffodil usually has pale yellow flowers with a dark yellow trumpet. From the side, the long and dark yellow corona of Narcissus pseudonarcissus flowers is particularly impressive. Besides their use as garden plants and cut flowers, daffodils are noteworthy for their toxin production. You can even observe this at home with a daffodil bouquet from your flower shop: The water in the vase should stay clear and clean much longer than with other types of plants because secreted toxins prevent bacteria and fungi from growing. However, these poisonous substances may also harm other flowers within a bouquet and therefore you have to be careful which plants you combine with daffodils or pretreat your daffodils (let them in a bucket of water before adding them to other plants). The toxins of the daffodil belong to the class of the alkaloids and are mainly synthesized in the bulb and also in the leaves. These substances cause skin irritations and itching and can even be deadly when ingested in certain quantities. Wild daffodils contain for example galantamine and lycorine. Galantamine, which is found in daffodils and related plant species, is particularly interesting, because it is registered as a treatment of certain forms of dementia and Alzheimer. However, galantamine can be synthesized chemically and does not have to be extracted from plants. 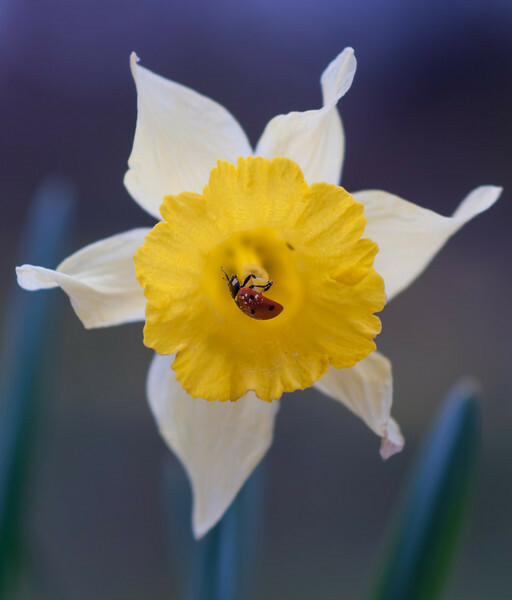 The deep corona of the wild daffodil flowers are a popular hiding place for all kinds of insects - in this particular flower a ladybeetle settled. (only temporarily though - it left immediately after this photographs has been taken). Carcolors 23: A very flashy and colorful carcolor composition. 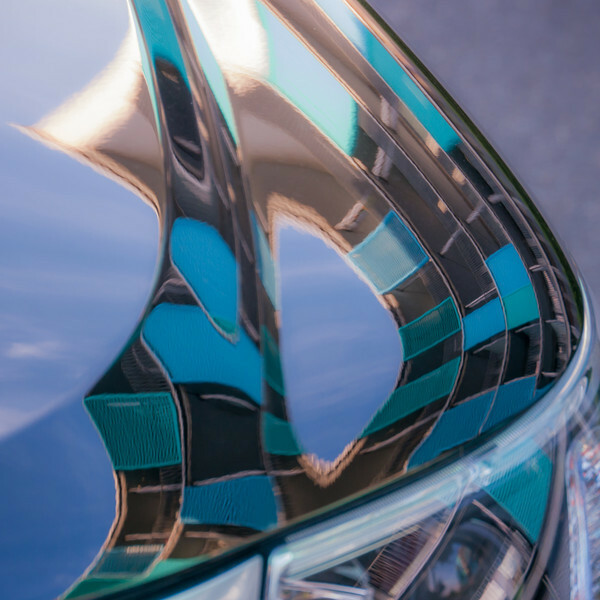 This particular car is displayed at a car dealer, where I have been searching for interesting distortions and reflections before (Carcolors 11 was taken at the same spot). This photograph was captured last weekend and I even remember the brand of the particular car - if you want you can guess :-). 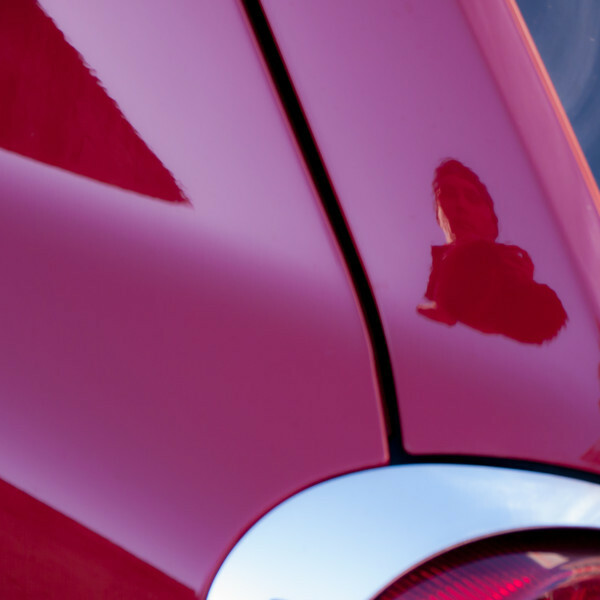 If you enjoy this car photograph, have a look at the carcolor compositions from earlier posts or at my Carcolors gallery. Here is another short update on my tilt-shift experience. I have not been taking many photographs recently and do not feel very creative, but these photographs are solely shown for educational and illustrative purposes anyway. I wanted to try the shift function of my recently purchased and described Mirex tilt-shift adapter. 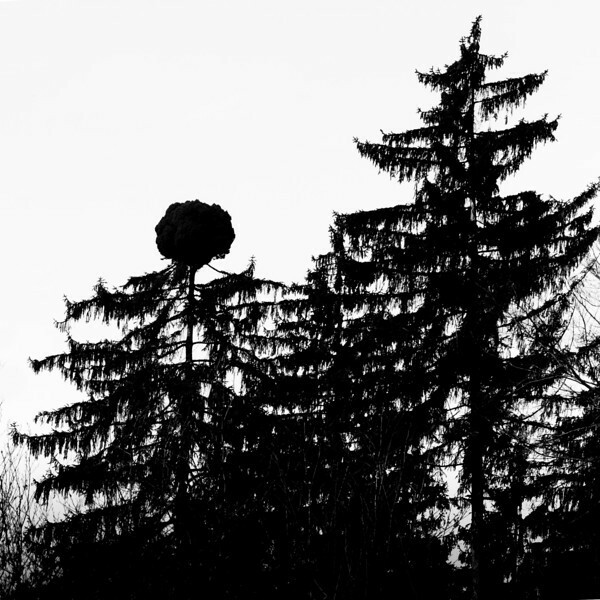 The photograph above shows a panorama that was captured from the Hochwachtturm on Albis, which is a small mountain and popular viewpoint (although less so in winter) very close to Zurich. The photograph was created by combining three captures (no shift and full shift to either side) and the lens was a Canon zoom lens (70-200 mm L, at f4). The images were recorded in 16:9 format (4352 x 2448 pixels). As the black borders on either side indicate (I left them on purpose), this lens's image circle does not cover the entire area created by a full shift (15 mm) of the Mirex adapter. The full panorama is almost 11'200 pixels wide and a crop without vignetting is still more than 8700 pixels wide - twice as wide as the original image format! I guess that each lens has a slightly different image circle and therefore the final size of such shift panoramas will depend on the particular lens that is used. However, this is one of the applications of the tilt-shift function that I have been interested in and I will certainly continue to experiment with it.